I know this is kind of silly, but this is one of the sweetest moments of my day. Yes, I love the quiet time with my hubby and the house is quiet...(I love being a Mom, but everyone has their limits! 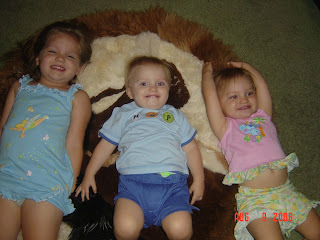 :-)) But I really love the way the kids all lay on the rug in the twins' room for bedtime prayers. They are so sweet and cuddly and started this little routine all on their own. It started soon after Grace and Nolan started to walk. We brush their teeth and then they run into their room and bury their faces in this furry rug. Then we pray together as a family followed by lots of hugs and kisses good night. Now granted, not every night is sweet and cuddly (especially after a long day and everyone is extremely tired), but this night was a fun moment and a picture I will cherish for the memories it reprensents. How cute! The rug looks very comfy to cuddle with! I am still in 3rd to answer your question and no, Grace has been there for about 10 years! Glad to see you guys are doing well!